If you’re looking for an individual illuminating solution, sophisticated and of high quality, your search has come to an end. Top Light provides us with all possible versions of their top seller Puk Wall. 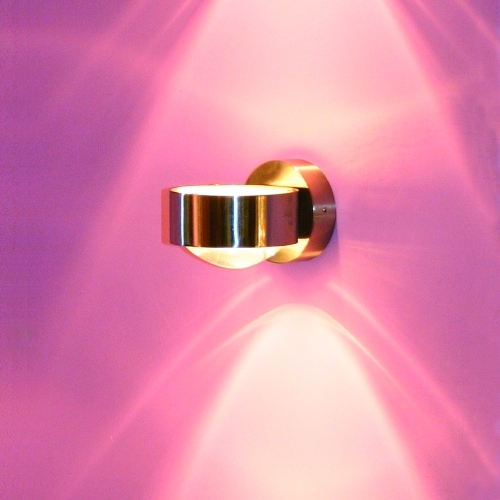 The Puk Wall light is completely adaptable to your personal taste and given arrangement. Plus its top quality and elaborated design offers you countless options to create an environment of your choice. Different lenses, glasses and colour filters can be chosen – and easily be changed - to create the mood you feel comfortable with. More than 5000 possible combinations make your personal Puk Wall lamp a one of a kind lamp. A few possible configurations can be seen in our online gallery as well as in our showroom in Bochum. Ordering your personal Puk Wall lamp is easy as you choose your favorite components one-by-one. You start by choosing your desired colour for the Puk Walls case. Choosing the proper glass or lens is a matter of personal taste. While lenses form a beautiful shape of light on any wall, glasses will have a smaller impact on the lights behavior. Colour filters can be a beautiful way to create a unique illumination. They can be easily changed if you wish to alternate your design from time to time. Please contact us via e-mail if you like to buy additional filters, glasses or lenses. Please note: It is highly recommended to buy at least a simple glass for each upper and bottom light as the case does not possess any covers or safety glass itself.